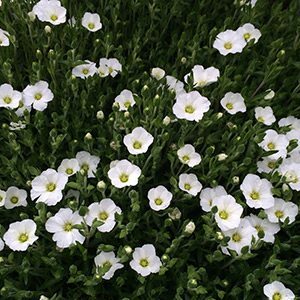 A attractive free flowering rock garden plant, Arenaria montana is a low growing perennial that can be used as a ground cover plant. It grows well in full sun to part shade, masses of small white flowers from spring into summer make a good display. Originally from the foothills of the Pyrenees and nearby areas, this evergreen plant can be used in a number of landscaping applications. Excellent in the rock garden, or used to underplant taller shrubs in the garden or container. Also useful to naturalise along rock retaining walls. Use Arenaria montana in a container where when in flower, the foliage will disappear beneath a sea of white blooms. Best grown in a position where it receives some moisture in summer, however remarkably hardy in most situations. This is a fast growing easy care plant that will form a dense matt over time. Maintenance is minimal and no pruning is required. Choose a humus rich moist soil with reasonable drainage. A position in afternoon shade is suggested in very hot areas. Deep water occasionally during long dry periods. Fertilise with a general purpose, slow release type fertiliser in early spring.